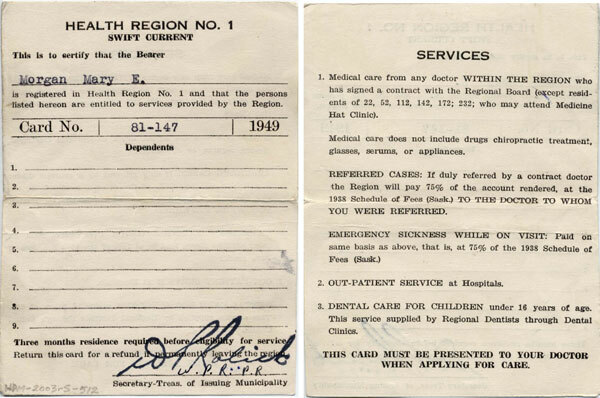 The Swift Current Health Region compulsory medical care plan was inaugurated in 1947 as an experiment to demonstrate how a tax-based plan administered by a democratically elected board could provide “medical and surgical services in the home, office, or hospital, partial payment of fees for necessary referrals out of the Region, and out-patient services through the local hospitals” (Malcolm G. Taylor, “A Canadian Health Program: What Are the Issues?” CMAJ 62 [April 1950]: 396). For the 55,000 plan members, compulsory taxes resulted in “the sense of security of full range insurance coverage, the assurance of availability of a higher standard of medical care, and free choice of physician” (“A Canadian Health Program”: 396). For local doctors, the experiment created an increased workload, in spite of the arrival of more practitioners, “but it [has] also provided the opportunity to practice without worrying about the financial burden on the patient, and an assured income on a fee-for-service basis averaging . . . something over $14,000 per annum from the regional fund alone” (“A Canadian Health Program”: 396). In November 1945, Swift Current’s residents voted to establish Saskatchewan’s first health region. The Swift Current Health Region was a self-governing authority that successfully provided a comprehensive range of health care services. 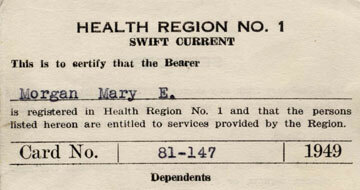 This health card belonged to Miss Mary Morgan. This is to certify that the bearer is registered in Health Region No. 1 and that the persons listed hereon are entitled to services provided by the Region.